The term "Sustainable Development" means the international recognised ideal of future capacity in our global community. Socially important topics like cultur, socialising and the economic potential shall harmonize in an environmental friendly way. "Sustainability" means that today and future generations will have access to resources to fulfil their needs. This process oriented and open-ended understanding of education requires the use of participatory methods. Thereby peoples abilities for participation will be encouraged. Education for sustainable development develops, where appropiate, the topics from the ecologically, economic, social and global point of view. For this purpose cooperation structures with instituions and initiatives from different fields are conductive. The aim of ESD is to ensure that individuals acquire the skills necessary for actively and responsibly shaping their future in the interest of a Education for sustainable development. In this context rational, emotional as well as action-related components and the ability of judgement play a key role. The concept for the acquisition of participatory skills (Gestaltungskompetenzen) was developed and tested from Gerhard de Haan (2008). 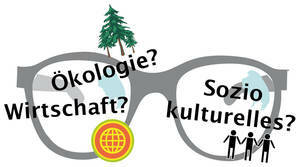 "Gestaltungskompetenz" describes the ability to apply knowledge about sustainable development and recognise the problems involved in non-sustainable development. show empathy for and solidarity with the disadvantaged. In order to promote structural competence successfully, it is important to enable key issues of sustainable development and a self-organized learning close to reality. Furthermore mention must be to allow student participation in the education process.